Manchester United got back to winning ways in the Premier League after last weekend's draw at Stoke thanks to a late flurry of goals against Everton. United went ahead through a fantastic goal from right-back Antonio Valencia that surely has to be a goal of the season contender. 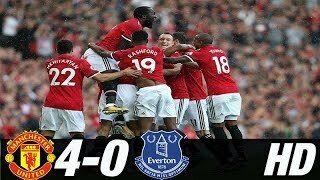 They found the next goal tougher to find but eventually the pressure was too much for Everton and goals from Henrikh Mkhitaryan, Romelu Lukaku and Anthony Martial meant the match ended up 4-0 to United. The game was Wayne Rooney's first at Old Trafford since leaving the club in the summer and Jose Mourinho predicted he would get the reception a United legend deserves - and he did from the supporters. Mourinho chose Marouane Fellaini to replace Pogba, while Ander Herrera and Michael Carrick were on the bench.